India is famous for its forts and palaces, the best witnesses of history and evidence of the bygone majesty and military power of kings. Forts of Goa are not the biggest in size, they can’t compete with the grand structures in Rajastan or Golconda Fort in Hyderabad, and many of them are in ruins. However, there is something that makes them absolutely unique among all the other forts of India – their location. Breathtaking views of endless ocean and coconut groves are worth every single step you would need to make to climb the hills of Goa to reach them. Besides, as all of the forts survived 450-years long Portuguese rule and mostly were re-built, all of them are marked by a strong influence of Portuguese architecture, which is unique to this country. Here is an exhaustive list of most Forts in Goa, which are worth a visit if you are a fan of history and splendid views (most of them you can see on the map above). Fort Aguada, which is probably the most known Fort in the state, is located in North Goa, just 7.5 km away from the Calangute beach. The Fort was built by the Portuguese at the beginning of the 17th century as a chief defence against the Dutch and the Marathas, and it is the only (!) fort of Goa which was never concurred. “Agua” means “Water” in Portuguese – the Fort got this name because of a fresh water spring which was located within the fort and supplied ships which stopped when passing by with water. A lighthouse, which is located in the upper part of the fort, is still working today and emits light every 7 minutes. Fort Aguada is often associated with a 5 star hotel Vivanta by Taj, which is a part of a complex overlooking Arabian sea. If you are not planning your holiday in this hotel but still would like to enjoy the romantic views in a luxurious atmosphere, you can visit Taj just for a dinner or some drinks and make use of its facilities. If you want to learn more about Portuguese era in Goa and visit the best maintained Goan Fort – then Reis Magos Fort should be on your itinerary. 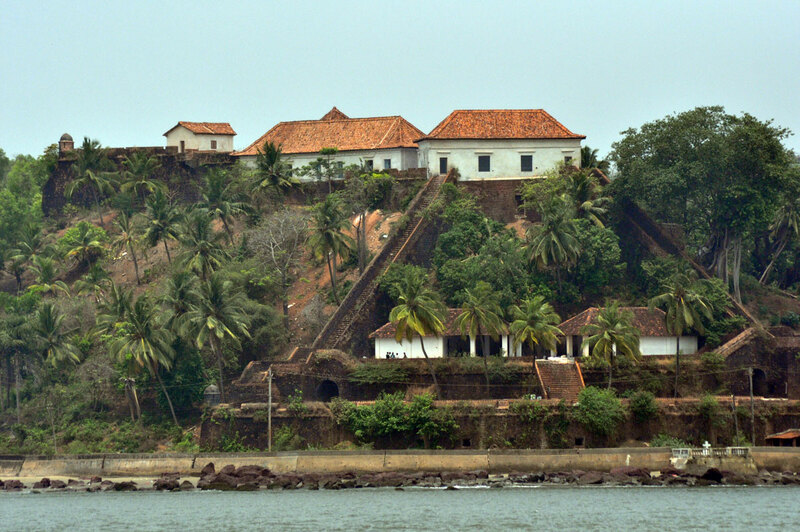 Reis Magos Fort is located on the bank of the Mandovi River, just opposite to Panjim. It was built in 1551 to initially protect the narrowest estuary and later, in the 18th century, it served as a home to the newly arrived Portuguese dignitaries. Reis Magos Fort was recently renovated and it is in an excellent state (unlike the majority of other forts in Goa). It also hosts a cultural center, which is also worth a visit if just the astonishing views which it offers are not enough of an attraction for you. You can also check out its official website for the exhibitions overview. Chapora Fort is located in North Goa, close to the popular beaches (3.5 km from the Anjuna beach, 1.5 km from the Vagator beach), which makes it an attractive destination for tourists and slightly crowded for the same reason. It is a Portuguese Fort which was built on a Muslim structure in the 17th century. Today, Chapora Fort mostly consists of ruins (as it’s been deserted since 1892), showing the shape of previous structures, but a fantastic view of Anjuna and Vagator beaches are priceless and worth the climb! Cabo de Rama Fort is located in South Goa (Canacona District, 30 km from Colva Beach) and, as the name suggest, is named after Lord Rama. The Fort was is one of the oldest in Goa and was built before the arrival of the Portuguese, however it came under Portuguese rule in the 18th century and was completely rebuilt. Two centuries later (till 1995) the fort served as a government prison. 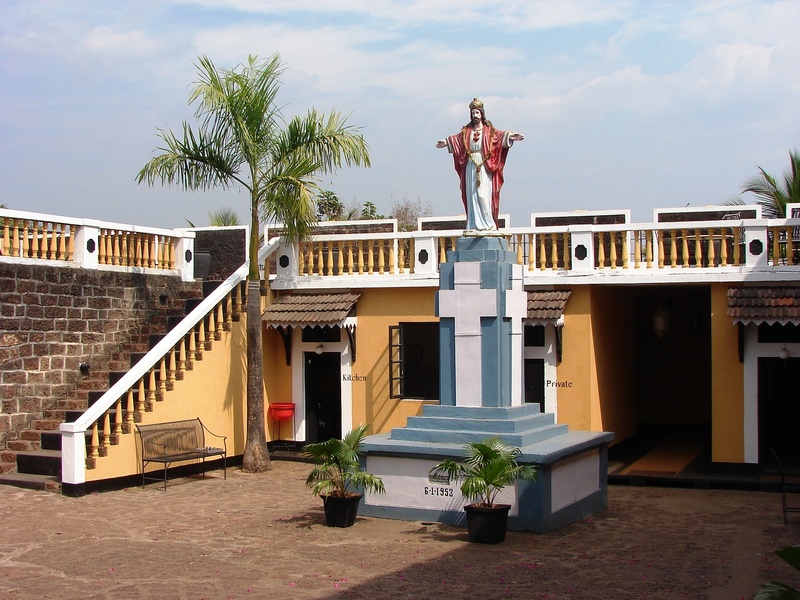 Inside the Fort you will find an acting church, but the main reason to visit Cabo de Rama is the views of the entire Canacona stretch which you can enjoy from the cliff, along with some monkeys who are occasionally to be seen in the area. Fort Anjediva is located on the Anjadip island and is the most difficult to access. It is often mistakenly considered to belong to Karnataka state due to its geographical location, but it does belong to the administrative rule of Goa. A former Portuguese territory, the fort, which was built to control a trade route and show a military power, has a rich history, but today there is little left but ruins, except for an ancient church (The Church of Our Lady of Springs) built in the 16th century. 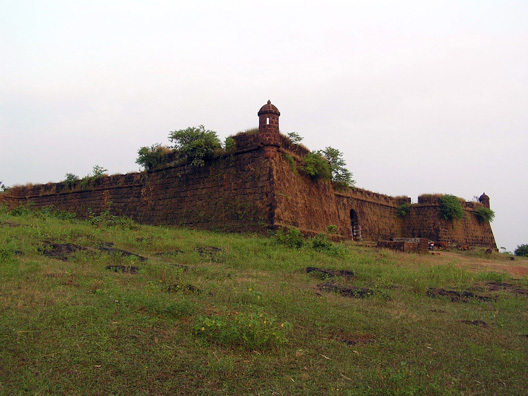 The Terekhol Fort is siuated on the Northest tip of Goa (42 kms from Panaji, 34 kms from Anjuna) and lies on the bank of the Terekhol River, facing Arabian Sea. It was captured by Portuguese in the 17th century, but almost a hundred years later, in 1825, it was used as a base for an armed rebellion against the Poruguese and it remained a symbolic location for freedom-fighters. The fort was converted into a hotel (Fort Tiracol Heritage), which was reported to be closed at this point, and hence an access of general public to the fort is unfortunately limited. The Corjuem Fort is situated about away 30 km from the coast, on the island of Corjuem, and it was used by the Portuguese as a military base and a military school. It is one of the oldest forts in Goa (it was constructed in 1551) It is one of the only two forts inland which were not completely destroyed. Currently it is mostly ruins which are covered with wild vegetation.The fort will offer you a somewhat different view in Goa of the surrounding land, vilages, islands and a river. When you walk inside, be careful – there is a huge well (called “well of death”) which is well covered by grass and bushes, so it is easy to fall down.